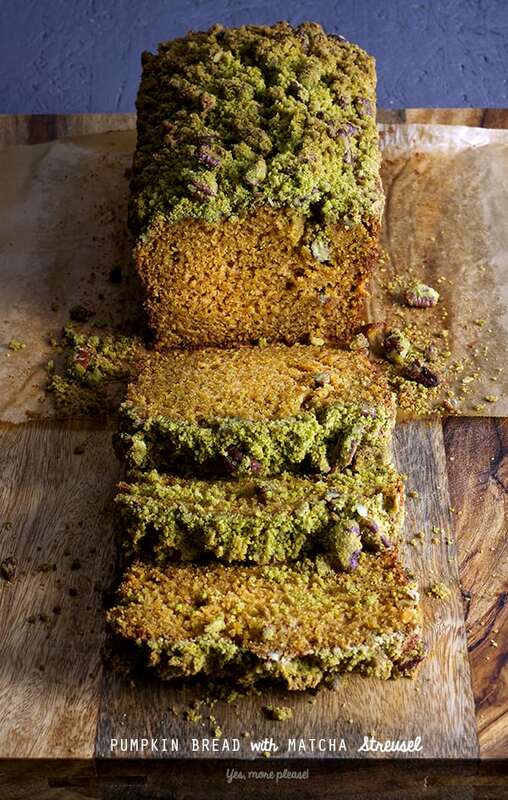 Matcha Streusel Pumpkin Bread ~ Yes, more please! October is here and I can’t wait for pumpkinized everything. My primary pumpkin craving is pumpkin bread (delicious moist and spiced). So, here is my spin for this season. Its delicious and a new flavor combination for you to try. 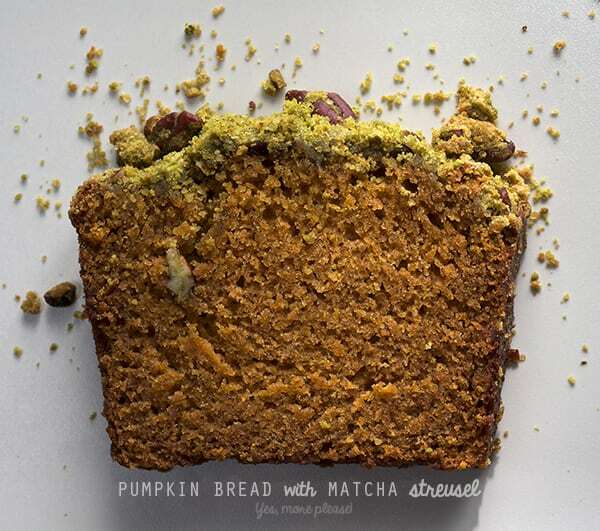 The pumpkin flavor with Matcha is like having tea within your slice. 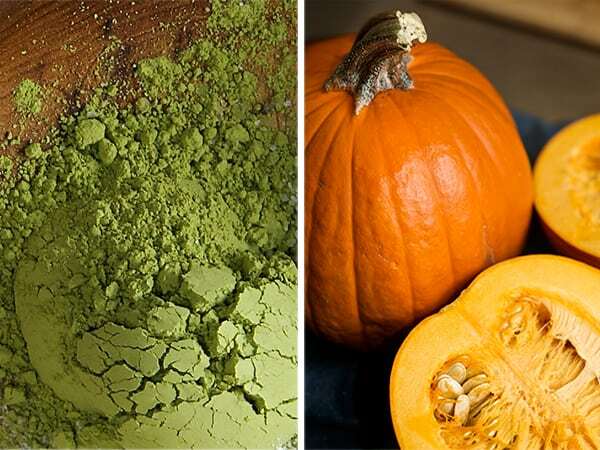 The Matcha green tea powder, tames the sweet sweet notes and enhances the pumpkin, and the spices. These are the ingredients that ordinarily don’t meet in a recipe and come from opposite sides of the planet. Sometimes thats the kind of combo that we need. 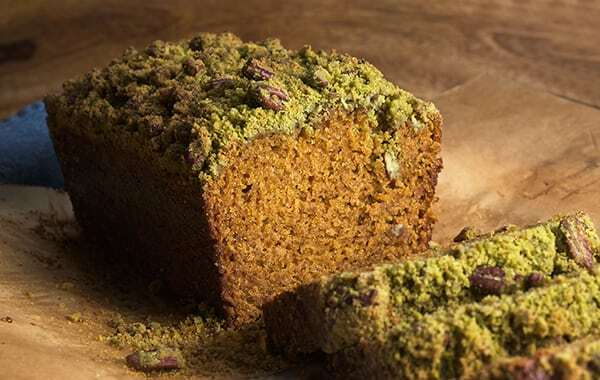 Matcha Streusel Pumpkin Bread will pumpkinize your tea time. Enjoy! Happy Fall and stay tuned for Octoberfest! Pretzels, sausage, and beer recipes coming up soon! 6 tablespoons butter room temperature. 2. In a large mixing bowl combine all dry ingredients. Whisk. 3. On a medium size bowl combine all wet ingredients, mix well until well combined. 4. Combine wet into dry and fold until well incorporated being carefull of not over mixiing the batter. 6. 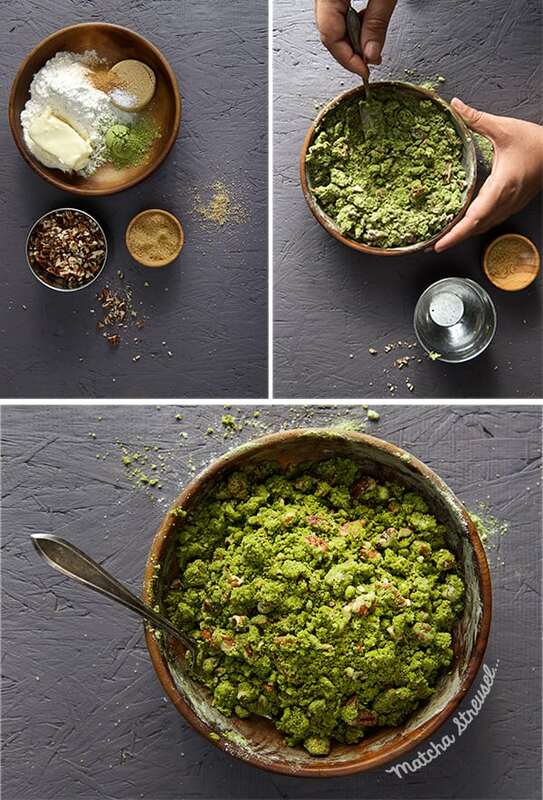 Pour batter into the mold and cover completely with the matcha streusel mixture. Lightly press so the crumbs stay attached to the top. 7. Bake at 350F for the first 30 min.- Check your bread at 30 minutes mark and tent it with a piece of aluminum foil shiny side up, to prevent he streusel to over-brown . Lower the temperature to 325F and bake for another 25-30 minutes. 8. Passed the 50 minutes mark, check near the center with a toothpick to check for doneness. Toothpick should come out clean with a few moist crumbs attached. Remove from oven and cool it on a rack for 20 minutes, before slicing. Once cool, slice it and enjoy!!! Store the bread in a piece of parchment paper and plastic wrap. It tastes better the next day!!!.. keep it safe and away from temptation… It will last for about a week, no need to refrigerate. 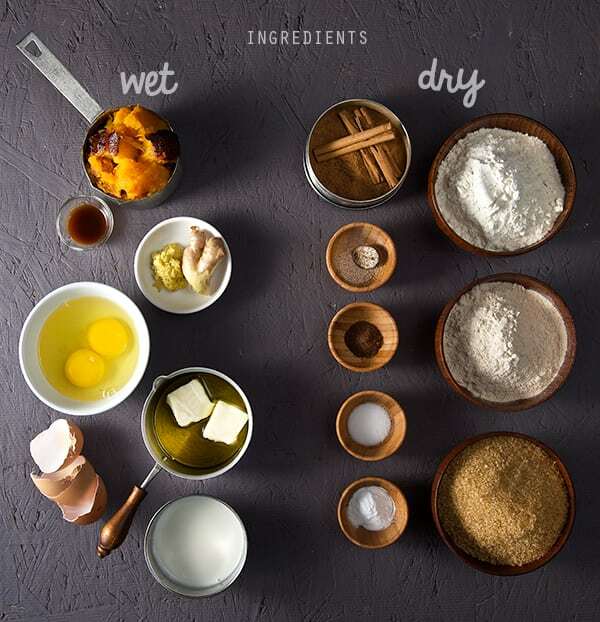 This recipe will work for muffins. Divide the batter into cupcake molds lined with cupcake liners, fill up a bit over 1/2 way and add 1 heaping tablespoon of matcha streusel, you will need to make a double batch of the streusel. Bake at 325F for about 20-25 minutes. 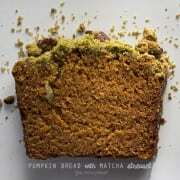 This Pumpkin Bread is extra moist, has a fine crumb, great spice flavor with our masking the natural pumpkin flavors. The crumbly matcha streusel is a top-notch addition. In a large mixing bowl combine all dry ingredients. Whisk. In a medium-size bowl combine all wet ingredients, mix well until well combined. Combine wet into dry and fold until well incorporated being careful of not over mixing the batter. 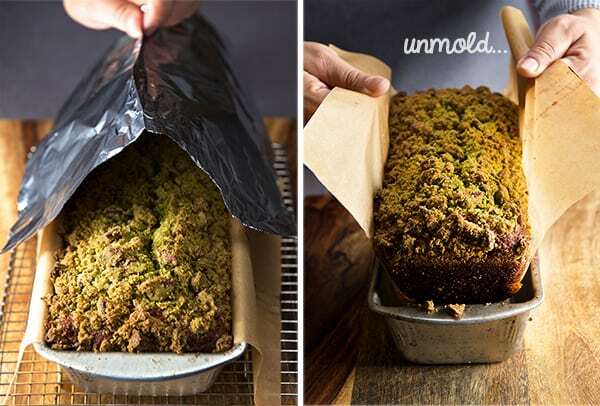 Pour batter into the mold and cover completely with the matcha streusel mixture. Lightly press so the crumbs stay attached to the top. Bake at 350F for the first 30 min.- Check your bread at 30 minutes mark and tent it with a piece of aluminum foil shiny side up, to prevent the streusel to over-brown. Lower the temperature to 325F and bake for another 25-30 minutes. Passed the 50 minutes mark, check near the center with a toothpick to check for doneness. Toothpick should come out clean with a few moist crumbs attached. Any combination of oils like: melted coconut oil, canola oil, will work. For the sugar: use a combination of coconut sugar and turnbinado, or brown sugar and turbinado, always use half and half to obtain a better crumb. For Eggs you can make a vegan egg using 1 tablespoon of ground flaxseeds and 3 tablespoons of water. Mix this well until frothy, this amount will make the equivalent of 1 egg. Notes: Store the bread on a piece of parchment paper and plastic wrap. It tastes better the next day!!!.. Keep it safe and away from temptation… It will last for about a week, no need to refrigerate. This recipe will work for muffins. Divide the batter into cupcake molds lined with cupcake liners, fill up a bit over 1/2 way and add 1 heaping tablespoon of matcha streusel, you will need to make a double batch of the streusel. Bake at 325-350F for about 20-25 minutes.